Above: The German-built boma at Kilwa Kivinje as it is today Below: one of the well heads or ‘Christmas trees’ at Songo Sonqo which are now being brought back into use. – a long planned fertiliser manufacturing plant – the Kilwa Ammonia Company (KILAMCO) appears to be back on the drawing board; Minister of Energy and Minerals William F Shija announced in August that discussions were continuing with M W Kellog of the USA and IFFCO of India on possible financing because the biggest development of all – the Songo Songo ‘Gas to Electricity project’ is now fully financed and being developed apace. – new efforts are being made by an Irish company which has taken over exploration following the numerous efforts over the years of such companies as BP, AGIP, AMOCO Shell, Shell Company to find viable quantities of petroleum through two wells being drilled at Mandawa, 30 kms inland from Kilwa; drilling equipment has been flown in by helicopter. 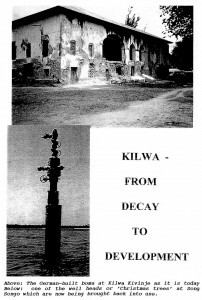 But visitors to Kilwa Kivinje must be saddened by the sight of a town seemingly forgotten by the world. The main street comprises dirty and derelict buildings on both sides of the road but the saddest sight of all is the old German Boma. Heavy rain earlier this year caused further damage to the building which now looks forlorn indeed. The old mango tree just outside town where the Germans hanged leaders of the Maji Maji rebellion was burnt down last year but the government has replaced it with a small monument. Following the collapse of a parastatal fishing company and the failure of the enterprise which succeeded it, a third attempt to establish a viable cleaning, processing and freezing plant is now under way at Kilwa Masoko and is showing considerable promise. Seithmar Ocean Products Ltd., the most important local industry, is employing 100 people and is shipping significant quantities of prawns, lobsters, crabs and sea fish to Spain and Portugal. It supplies local fishermen with outboard engines, nets, and ice and then collects the fish they are able to catch. The products then have to travel with difficulty in massive 20-ton refrigerated trucks at -20 degrees C along the appalling road to Dar es Salaam. The operation needs lots more fish; it is also greatly handicapped by the widespread dynamiting of fish stocks by people from outside the area and the government’s inability to stop it. If all goes well a bright orange smokeless flame at the top of a 100ft. flare stack will pierce the night skies of Songo Songo island later this year and signal the beginning of what must be one of the biggest, if not the biggest, development projects under way in East Africa at the present time. The gas field was discovered in 1974 and later relinquished by AGIP. It was further developed from 1986 to 1985 by the Tanzania Petroleum Development Corporation (TPDC) and 9 wells were dug of which 5 are producers. The company now formed to develop the field is SONGAS. Its Assistant General Manager Gary Boucher told TA that all the funds needed ($300 million from the World Bank, TransCanada Pipelines, Ocelot Energy Inc., the government and several other donor agencies) were now available, subject to final contracts. Although there had been a six month delay caused by the need to complete a number of supplementary agreements, everything was now ready to start and the whole thing should be completed by the end of 1998. This complex project will finally bring into use three offshore and two onshore wells. The well heads constructed at the time and known in the trade as ‘Christmas trees’ are likely to have become heavily corroded over the years and the first job, (being undertaken by the Canadian companies Ocelot Tanzania Ltd and TCPL Tanzania Inc. on behalf of TPDC will be to test, repair and increase the tubing size on two wells to increase the gas flow. Then the new company which has been formed to implement the project – SONGAS – will be able to start work on building two 35 million cubic ft. processing units on Songo Songo island; it will construct water and power supplies, roads, an airstrip and wharves on the island; build a 25 km 12″ diameter underwater pipeline to Somanga Funga (bypassing Kilwa to the north – see below); lay a 207 km underground pipeline from there to the Ubungo Power Plant and the Wazo Hill Cement Plant in Dar es Salaam; then will follow the purchase of an additional gas turbine generator to add to the four already owned by TANESCO at Ubungo and thus produce 150 megawatts of electricity to fuel Dar es Salaam’s growing industries. The gas supply is expected to last for at least 50 years. ‘The Government is Warned’. This was the front-page headline in ‘Taifa Letul on August 11 as indignation about the fact that the gas was to be sent to Dar es Salaam and not used directly for the benefit of the southern Region of Tanzania. Wananchi wa Kusini wasema kunyang’anywa gesi hiyo ni kufyekwa miguu na mikono….Wadai gesi hiyo ni zawadi toka kwa Mungu (Southern people say that to be deprived of this gas is like sweeping away their arms and their legs ….. they claim that this gas is a gift from God) the article went on. TA understands that the reason why the gas has to be piped first to Dar es Salaam and then converted into electricity is the availability in the capital of numerous industries able to use the gas directly – something which does not apply to Kilwa or other parts of the Southern region. But a Rural Village Electrification scheme is envisaged for some time in the future.